PEBBLES: The darling green tunic with black accents individually made by me is a bit shorter in the front like Pebbles and comes with little blue diaper covers. Pop a little bone in her hair and you've got your own little prehistoric babe. This is what my oldest niece will be wearing this Halloween. BAM BAM: This costume was created by popular request to coordinate with my pebbles costume. 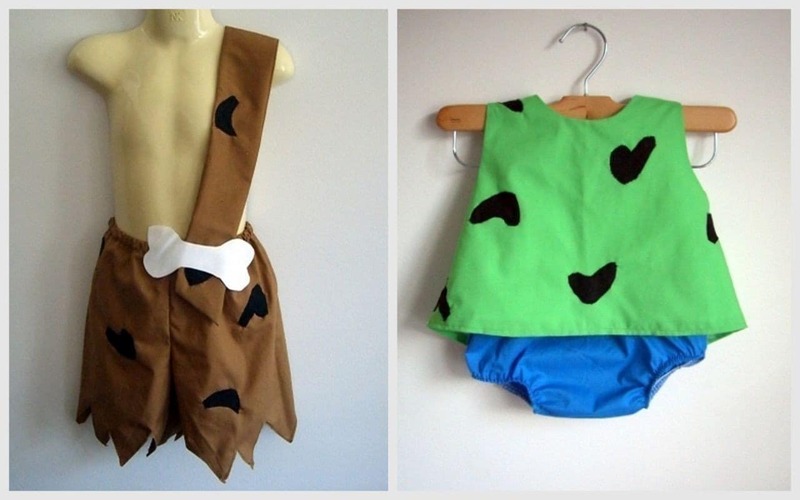 This costume is composed of bam bam's little shorts and strap and topped with a felt bone pin making the strap adjustable. Bam bam hat and pebbles hair clip available but sold separately see my costume section for those listings. The hat color WILL match the outfit as long as purchased at the same time. The color difference because of the different times the photos were taken. Please check the drop down menu for size and color availability at this time. YES YOU CAN ORDER DIFFERENT SIZES FOR PEBBLES AND BAM BAM. To do this please write the sizes you want in the notes section when you check out. Please indicate sizes at checkout. Costumes are made to order and take up to 3 weeks before shipping. Please contact me prior to ordering if you need a quote on rush processing. Also note that in September we switch to a Halloween shipping schedule since things get so busy. Please order early if possible. Loved how well done these costumes were made. My daughter and nephew looked perfect.